People's Park is history in Berkeley, California -- it might look like just a ratty little square of sandy grass and forlorn trees off Telegraph Avenue, but the symbolic and political dimensions of the Park are complex and deep. People's Park evolved through the sixties and seventies with Berkeley's Free Speech Movement, the SDS, and the various events of the anti-war and anti-authoritarian movements. People's Park became a piece of permanently-occupied University of California (UC) ground, originally occupied during a struggle over the threat by UC to build dorms and a parking lot in an area otherwise devoted to much smaller housing, apartments, and shops. In the demonstration that followed, the National Guard shot one bystander dead (a man by the name of James Rector) and wounded some 128 demonstrators. 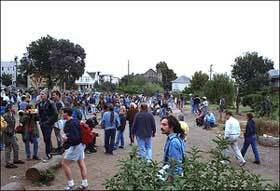 Over the next twenty five years, a standoff resulted, with UC eventually leasing it to the City of Berkeley for general (but from UC's point of view, temporary) use as a park. In short, the Park means a lot to many non-students; either as an informal memorial to Rector, or as one of the few parks in the area, or, more commonly as the nineties started, a relatively safe place for the homeless to hang out during the day, sleep out at night, and pick up a meal from one of the semi-permanent kitchens run by the religious groups in the Park. Above all, it came to represent one of the very few victories of ordinary Berkeleyites against the University; to be able to stroll the Park was to be able to remind yourself that sometimes you can win against the machine.... 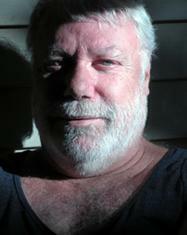 Many older people also felt that UC kept trying to get the Park back to attempt to finally erase its shame over the Free Speech Movement and the bloody-minded and lethal way it had supressed free speech and democracy during the sixties and seventies. By 1991, UC Berkeley was ready to take People's Park back -- with force if necessary -- and the people of People's Park didn't want to let them have it back. Ostensibly, UC wanted to build a bunch of Volleyball courts on the Park, and, in the process, evict the homeless, the semi-homeless, and the Telegraph Avenue locals who either lived in the Park or used it for everything from lying around in the sun listening to impromptu concerts, to just reading or stretching during a lunch break, to doing the inevitable drug deals. So, on July 31, 1991, after fruitless negotiations, UC sent in the bulldozers to clear the park; over the next week or so, protests and riots broke out, causing injuries to demonstrators and police, damage to businesses on Telegraph Avenue, and much classic Berkeley breast-beating.